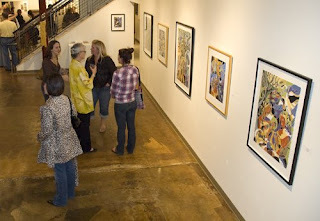 The opening reception went really well with a steady flow of people coming throughout the evening. It has been wonderful to share my art with so many people. 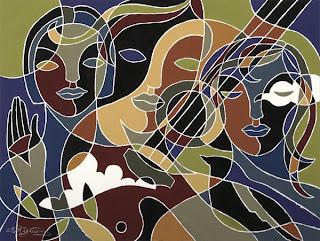 I am thankful to everyone who takes the time to go to the gallery to see my exhibit and especially grateful to those who are purchasing the paintings. 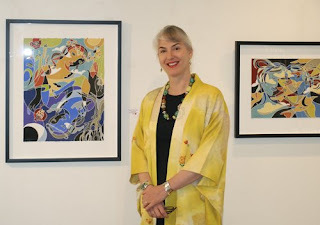 Here is a photo of me in the gallery and one of the dwindling crowd at the end of the opening. You can see some of the paintings in my exhibition on my website in the “Gouache” section. The exhibit is hanging and looks great. It has been previewed, and started off successfully with two paintings sold the day before the opening. I am so thankful, happy and excited about the opening tonight! 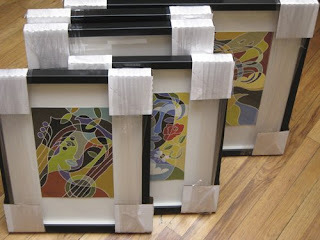 Here are some of the smaller pieces just back from the framer and ready to be delivered to the gallery. One week from today my first solo show at Palmers Gallery will be opening. It runs from March 20 until April 11, 2009. I am really excited and have a few butterflies in my stomach in anticipation. The postcards have been sent and the emailers go out today. 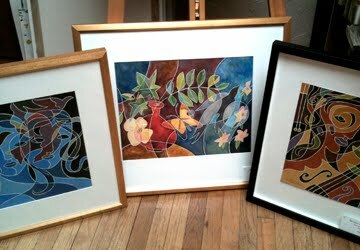 I am really happy with all of the new paintings and will pick up the last three from the framer this afternoon. 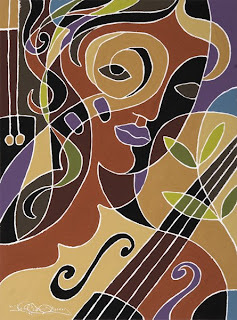 Here is the gouache painting, “Woman with Violins”, that we selected for the postcard.